As proposed earlier, I have put this subject in a separate article, to keep the information on both Gem mining and Embedding separated and thus hopefully easier to comprehend. The main purpose of mining in Kingdoms of Middle Earth is to acquire the Gem Shards needed to make the Gems used for embedding in gear. What types of Mines are there? What are the possible drops? 1. What is Mining exactly? 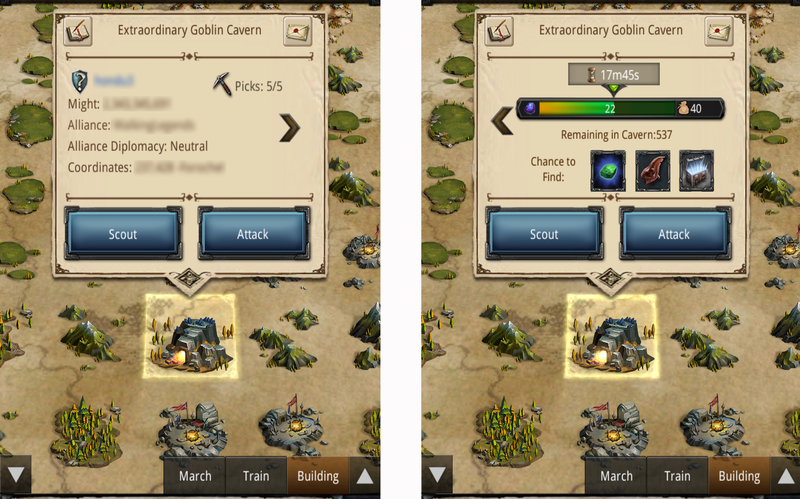 The process of mining is very similar to attacking Goblin Camps as we have known from the start of the game. Mines are a new type of Wild that can be found on the map, similar to Mountains and Lakes for example. When a Mine is attacked and the forces there (either Goblin or Player’s) are defeated, a 40 minute mining process is started. The main purpose for Mining is to extract Gem shards, which can in turn be used to craft lvl 1 Gems in the Sage Tower, and then upgraded to higher levels in the Forge. But there are more aspects to the process. Mines for example drop far more than just shards, as will be discussed in point 5. Another major difference between normal Wilds and Mines is the fact that even under a bubble, you can attack or be attacked at a Mine on the map, making defense strategies quite important. 2. What types of Mines are there? Both mine types have a certain amount of Gem shards that can be mined from them. Once all the shards from a mine have been depleted, it collapses, leaving a ruin as shown on the right above. Mines periodically respawn on the map, but exact numbers on this are unknown. 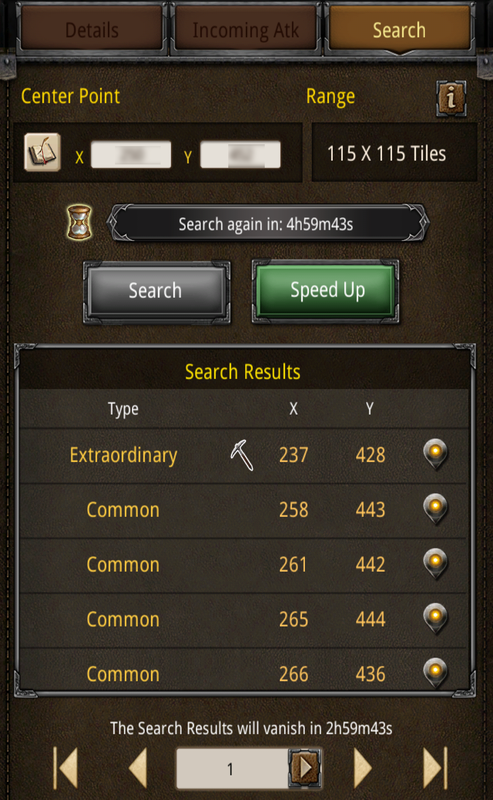 In terms of Gem shard mining, both types are identical and should be approached the same. The only big difference at the moment are the possible additional drops that can be gained from mining, which are larger and more diverse for extraordinary mines. 3. How do you find Mines? As the Mines are scattered on the map, it is possible to just scroll along and find them manually, and maybe if you’re lucky, you’ll stumble upon some extraordinary ones. But this is rather tedious. Fortunately, the game offers a better method: searching with the Watch Tower. The Range box shows the size of the rectangle the tower will be searching in. The range depends on your Watch Tower level, increasing 5 in radius for each level with the maximum range being 120×120 tiles as shown above. Please not that the number of extra tiles grows (exponentially) with increasing level, so going from Watch Tower 9 to 10 adds more searchable tiles than from 8 to 9. To the left of the range is the center point of the search area. For a range of 120×120 this means a square going 60 tiles outwards in all four directions is searched. The center point is by default the city in which the Tower is located, but a Tower of level 8 or higher, you gain the option to place the center point elsewhere. Below the Center Point and Range is a refresh timer bar. 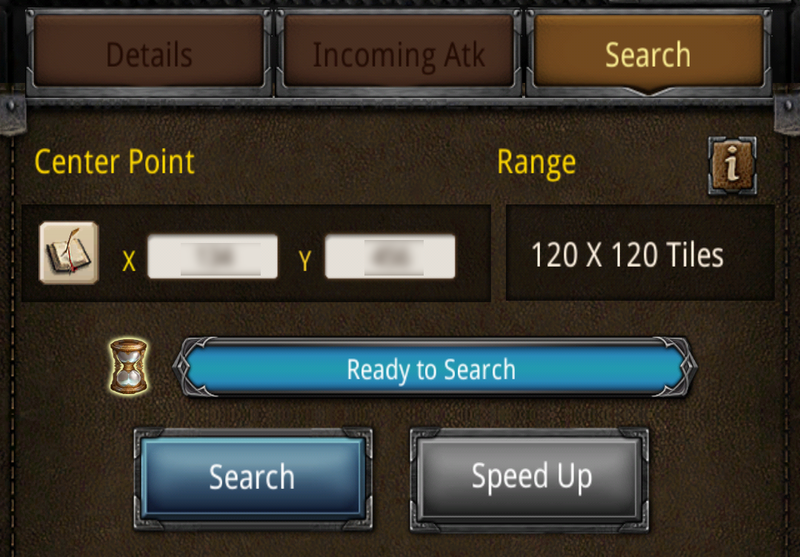 When it is full it states ‘ready to search’, and after filling in the center point of choice, the search button will reveal the found mines in the selected area. The timer takes 6 hours to fill, but this process can be sped up using hourglasses. Next to that are shown the coordinates on the map. Pressing the button on the right goes to the selected mine on the map. Please remember that once searched, the search results in the Watch Tower do not update, so Mines could become occupied between searching and attacking! 4. How do you start Mining? Shown on the right are the remaining Gem Shards in the mine, a small sample of possible drops, and possibly the status of the current Mining action in progress,with current Gem Shards mined and time remaining (max 40 minutes). Two options are given: Scout and Attack. Both work the same as used for other purposes. Use the scout function to check enemy troops (primarily if you want to attack a mine held by another player) if you want to. If you decide to attack, you will be guided through the normal select Hero/select Troops screens, and once completed your march will be on its way. Quite simply, defeat results in the hero returning, while winning automatically starts the Mining process. While Mining, the Hero leading the Mining party is shown on the map above the Mine. 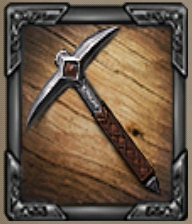 In order to attack a Mine, a special item is needed: The Dwarven Pickaxe. Pickaxes work similar to Stamina points for campaign, in that they have a maximum (5) and respawn over time (3 hour respawn time). And also similarly, they can be replenished with Mithril as well, at a price of 30 Mithril per set of 5, or 6 Mithril per Pickaxe. Additionally, they appear in Tournament prizes, Chests, and login prizes. A Mining action takes 40 minutes in all situations initially. Initially, because it is possible to be attacked before the process is over, and if defeated, you will be sent home without the maximum possible gains from the Mining, as some shards will be stolen by the attacking player! After the Mining process is complete, either by completing the maximum 40 minute run, or by being attacked and defeated by another player, the Hero and remaining forces return home, and a Mining report is delivered in your mail, similar to battle reports. The Mining Reports show the number of Mined shards and the number lost (if attacked and defeated), plus any additional chance drops from the Mine. As with other Wilds, you can reinforce a Mine with your own troops or have an alliance member reinforce it. As Mines cannot be made immune to attack, not even when bubbled, this is a valuable option in servers where a lot of fighting for (extraordinary) Mines takes place. Sending reinforcements can be done through a button displayed when clicking on a Mine on the map. I am not sure about the maximum number of possible reinforcements, but I assume it is linked with the level of your Embassy in some way, similar to normal City reinforcements. The number of Gem shards you can gain from one Mining operation is dictated by your level of the Research Gem Pouch. At level 10, 40 Gem Shards can be obtained per attack. This number is the same regardless of the type of Mine. Simply upgrade it to 10 as soon as possible for the most efficient mining. 5. What are the possible drops? *Honor Crystals do not have a function in the game as of yet, and serve as a placeholder for some unknown future feature or item. As Mines cannot be shielded by a bubble, it might be important to be prepared to defend them from attacks from other players. The strategy for attacking and/or defending a Mine differ per server and area on the map. In quiet areas on the map with no Hostiles, sending full armies might be a waste of troops/effort. But being in a crowded hostile area does not automatically mean you should reinforce and defend Mines to the death. I guess it will be a personal choice on what you send. I tend to send very small armies that are capable of defeating the Goblins easily, but do not pose major TK jackpots for Hostiles. In any case, make sure you send a reasonably high level, and geared Hero along to not make it too easy for opponents by default. The strategy is also important for the fact that because they cannot be bubble protected, potential TKers can just search for Mines and clear all the armies in Mines that are occupied. Having a large army with a weak hero Mining is a sitting duck for players looking for easy TKs, so avoid that situation at all costs. If you see your mines attacked a lot, decide whether you will send small armies to not give many TKs away, or go to war and send you best Heroes and full armies to attack or reinforce. Conversely, if you are looking for TKs, it is worthwhile checking the occupied Mines in the area, scout for defenses perhaps, and catch unsuspecting Miners off guard! ANother possibility is luring in Hostiles with medium sized, low hero armies, and come back full force once they have taken over the Mine. Of importance here is also how the Mining process is dealt with at the server level. On my server, many alliances agreed to not attack blues and neutrals, and never use Master Rangers to attack occupied Mines. Agreements like this can radically change the way and necessity of defending your mines, so make sure you know what the deal is on your server or within your alliance! This entry was posted in Articles, Strategy and tagged Alliance, amber stone, attack, bubble, campaign, center point, common, craft, crimson crystal, cursed watcher's, demounting rune, equipment, extraordinary, forge, forge rune, friendly, gear, gear chest, gem, gem pouch, Goblin, goblin cavern, gold, Hero, hero equipment, hostile, kabam, kingdoms of middle earth, lieutenant's weapon, map, might, mine, mining, neutral, orc ear, pickaxe, range, reinforce, reinforcements, research, resources, rune, rune of destruction, runes, search function, shard, shards, tk, token, topaz stone, troops, valto rune, watch tower, wilds by beardmonkey. Bookmark the permalink. I am using mines for tk tournaments and it was working fine until I switched my defensive hero to Thorin from Radagast. Another hero took over and it’s gear was not very good and I lost all my troops in one attack. I was wondering if anyone knew which hero becomes the main defending hero at a mine. Details – Thorin was sent first to the mine. 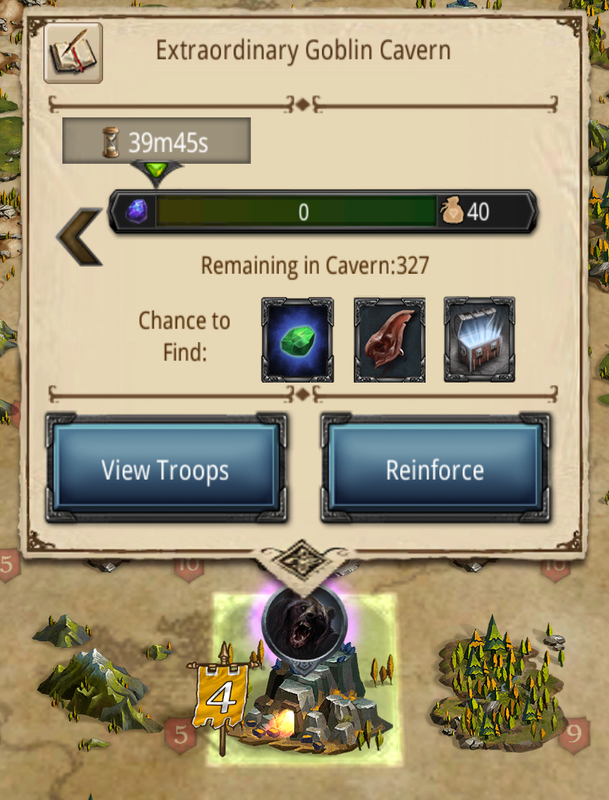 I think that I sent the same number and kind of elven troops with each hero (almost all level 250 if not all). The one that took over (i.e. appeared in the report) was from a different city but appears at the top of the list when you are picking heroes for attacks. I cannot figure out that order either. I would like to make sure for the next tk that I get to pick the hero that is defending at a mine. could very well be it! forgot those. Thanks, I’ve added them! ??? Never seen those, whats in them? I noticed that reinforcing or scouting a mine costs 1 pickaxe. So if there is a risk of a mine to be attacked, a good strategy is to save at least one picaxe to payback. Using all yout pickaxes at once is a very risky strategy. You’re right. Scouting is free. My mistake. Sorry if mentioned before, I did not notice. I’m in world 91. The agreement has been going on for just over a week without many hickups. Sometimes mistakes are made, but in general, alliances play by the rules they agreed upon.